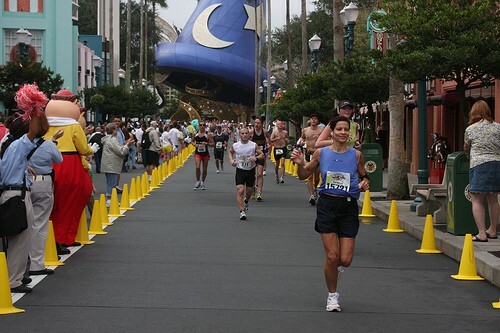 Each year in January the Walt Disney World Marathon takes place. Where better to run a challenging 26.2 mile marathon than Walt Disney World? For 2012 the Disney marathon events will take place from 5th January to 8th January 2012. The full marathon will take place on Sunday 8th January 2012. The course route takes you through all four of the Disney parks – Disney’s Epcot, Disney Magic Kingdom, Hollywood Studios and Disney’s Animal Kingdom. So at least the scenery will be able to distract you from just how exhausted you are some of the time! And of course there is no other Marathon in the World where you would be able to have your photos taken with Disney characters along the route. Who better to motivate you than a Disney Princess or Mickey Mouse? The Disney marathon course starts just outside Epcot on World Drive. The finish line is also in Epcot (in the parking lot) and competitors will have plenty of water and food stations around the course. The start of the event is at 5.30am. All competitors must maintain a 16 minute mile pace. It is suggested that you train for the marathon at a 15 minute mile pace. This is Disney of course so the Marathon is started by Mickey Mouse and his friends pressing the button for the start of the fireworks which start the race. You have to be at least 18 years of age to register for the full Disney World marathon (there are options for other ages). The registration fee is now $160 per person. For future events usually Disney offers a discount if you register early so bear this in mind for 2013. Registration always fills up as of course there are only a limited amount of entries allowed each year. So you do need to make your registration application as early as possible if you want to qualify. New for 2012 is the Walt Disney World Marathon Relay. This event will be part of the full marathon but will allow participants to run as a 2 person team – so each completes a half marathon. The first half includes Epcot and Magic Kingdom, whilst the second part includes Disney Animal Kingdom, Disney’s Hollywood Studios and finishes in Epcot. The registration fee is now $320 for the team. If you can’t find a running partner for the relay marathon you may want to run the Walt Disney World Half Marathon. This is held on Saturday 7th January 2012. Now in it’s 15th year the Half Marathon starts at Epcot and goes to Magic Kingdom before going back to the finish line at Epcot. For the truly dedicated you may want to consider the Goofy Race and a Half. Participants run both the full marathon and the half marathon. If you want to make this a family event there consider the Disney Family Fiesta 5K featuring the Three Caballeros. This family event takes place in Epcot. The fee is $50 per participant. There is also a stroller division of this race with a $55 entry fee. For those aged 13 and under the Disney Kids Races there are various races including a Diaper Dash for those aged 12 months and under. The Walt Disney Marathon weekend has special events to keep all the entrants and their families busy. The Pasta in the Park buffet dinner is held on Thursday January 5th to get the weekend of to a celebratory start. Tickets are $47.50 for Adults and $28.35 for Children (ages 3-9). Pasta in the Park is held in the World ShowPlace Pavilion in Epcot. A separate admission ticket to Epcot is also required. Disney’s Health and Fitness Expo starts on Thursday January 5th and runs to Sunday January 8th 2012. This is held at HP Field House and Jostens® Center at ESPN Wide World of Sports Complex. There will be guest speakers featuring celebrity runners, official race merchandise and exhibition stands. This is also the place where you will pick up your registration packet. If you want to register for the Walt Disney World Marathon 2012 go to Registration for more details. You do need to hurry as most of the events are almost at capacity. All weekend there will be special Disney transportation from all of the resorts. This includes transport to the Fitness Expo and to the start lines (and from the finish line of course). The monorail resorts will not have buses to the races but you can use the monorail to Epcot. You must be aware that if you are staying at one of the Epcot resorts then you must take a bus to the start line. The World Showcase International gateway entrance to Epcot will not be open in the early morning so do not make the mistake of thinking that you can walk through that way to the start line. The only way to get there from the Epcot resorts is by bus. You do not need a park ticket to enter the Walt Disney Marathon. But of course many of the competitors and their families do stay at the resorts and visit the parks. If you are visiting the parks on that weekend and are not involved in the Marathon this does have a big effect on park attendance. January is usually a quiet time but the Disney Marathon weekend is busy. There will be some road closures on the Saturday and Sunday when the races are held so if you are going to the parks in the morning you will need to allow extra time. For everyone competing the Walt Disney Marathon is an amazing event. Will you choose to be part of it. Leave me a Comment below if you have ever competed in the Disney Marathon or if you are going to in the future.